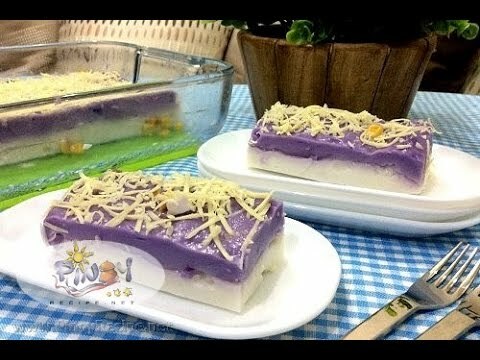 Ube Maja Blanca, a popular Filipino kakanin, is a coconut pudding that has the purple color from ube or purple yam. The name ‘maja blanca’ basically means ‘white delicacy’ and can be traced from Spanish milk-based desserts. It is related to ‘manjar blanco’ and ‘blancmange’ which are traditional holiday desserts. The Philippine maja blanca incorporates toppings like coconut flakes, corn kernels and/or grated cheese to get those tiny bursts of saltiness and sweetness which are truly irresistible. This could be your maja blanca with a twist of ube if you’re ready to rock your kitchen skills even though they may be non-existent. It’s easy! With a mixture of coconut milk, cornstarch and ube powder of flavor, cook it over low flame until it thickens so you can get that delightful creamy and velvety combo. Enjoy the smell of simmering coconut milk, ube and vanilla extract as you cook. And don’t forget to sprinkle it with Cheese toppings before you take your first bite. First we need to prepare an 8×8 inch pan and lightly greased with oil and set aside. Coconut Layer: In a saucepan, combine all ingredients and stir well to dissolve the sugar and corn starch. Bring to a boil over medium heat, stir continuously until you reach the sticky consistency. Now, we’re going to make our Ube Layer: Using the same saucepan, combine all ingredients and stir well to dissolve the sugar and corn starch. Again, bring to a boil over medium heat, stir continuously until you reach the same consistency with your first batch. Then, fire off and pour the Ube mixture on top of your coconut mixture. Spread and flatten evenly as possible and top with grated cheese. Set aside and let it cool at room temperature, before serving. Looks yummy! Love the pretty color! Never heard of tasted it before, but I bet it’s yummy, I love coconut. Oooh this sounds divine and looks so pretty!! Can’t wait to try it! ang sarap nito! i would love to try this someday. I will try doin maja blanca after I read all those ingredients. Yum-Yum…. It looks delicious! Thanks for the recipe…. I have never heard of this before. This sounds very good and looks great. Oh yummy. My family loves “kakanin” We will definitely try this Ube Maja Blanca one of these days. Thanks for the recipe. More power and happy holidays to all. Peace. This looks so good. I am making this after I get all the ingredients at the store.